On October 21, 2008 (Tuesday) at 1400 hours, Victim Luciano Brash was shot at a home in Alhambra. His body was then dropped off at the Pacific Orthopedic Medical Center, 707 S. Garfield Avenue, Alhambra. The suspects should be considered ARMED AND DANGEROUS. Investigators are seeking the public’s assistance, and asking anyone with information to contact Sheriff’s Homicide Bureau. 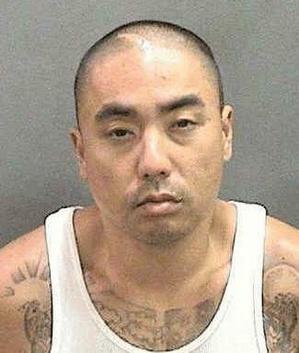 Sheriff’s detectives identify this man as Scott Young Kim. A 37-year-old male Asian. He is wanted in connection with the Brash homicide. It’s believed he was the shooter. Sheriff’s detectives identify this man as Samuel Patrick Groft, a 28-year-old male white. He is also wanted in connection with the Brash homicide. he is believed to be one of two men seen in a videotape dropping Brash’s body on the floor of an Alhambra medical clinic. Here’s a videotape of two men dumping Brash’s body in the reception area of an Alhambra medical clinic. There is also an alleged connection between the men and the Korean Mafia, officials said. Here’s a Wikipedia entry on the Korean mob and gangsters known as kkangpae.